1) Log in or register at https://biss.pensoft.net/. Note that emails originating from pensoft.net about the status of your work are often interpreted by overzealous email systems as potential spam. Please whitelist or otherwise train your email system to recognize these vital communications. 2) If you are starting a new abstract, click the “Start SPNHC+TDWG 2018 Conference Abstract” button. Clicking this button takes you to the ARPHA writing tool and creates a new Untitled abstract with some of the author metadata you used to create your account. 3) If you have already started an abstract and are coming back to work on it, log in to ARPHA directly from https://arpha.pensoft.net. After logging in you will see the titles of “My recent manuscripts.” Click on your manuscript title, or click on “See More” to go to your dashboard https://arpha.pensoft.net/dashboard.php of all manuscripts on which you are listed as an author, their status, and revision history. If you accidentally create more than one abstract, you need to delete it here. You can also start new abstracts here, but you will need to specify the journal (BISS) and the manuscript type (conference abstract). 4) Click “Collections” on the top navigation bar of your manuscript (top right of figure below). This is where you find the conference (SPNHC or TDWG 2018) and subcollection (includes topics for SPNHC and list of symposia, workshops, and other contributions for TDWG) to which you are submitting your abstract. This step is critical as your abstract cannot be directed to the proper editors without a collection/subcollection designation. Note that both authors and editors now have the ability to change the collection designation while they have control of the manuscript. a. If you are an invited speaker for a symposium or workshop in TDWG, select it from the options in the list. b. If you are submitting an oral presentation for consideration by a symposium or workshop that is open to submissions (see list and check whether the one you are interested in will accept unsolicited contributions), select it from the options in the list. Note that this does not guarantee that your submission will be accepted by the organizers. 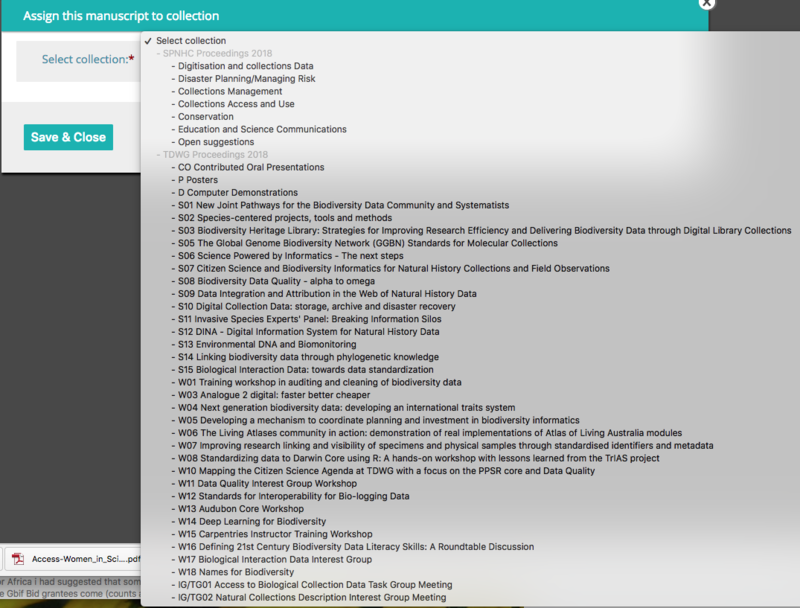 c. SPNHC Collections will not be explicitly visible on the manuscript page, but clicking on the Collections icon will show you the collection to which your abstract has been submitted. TDWG collections are displayed on the manuscript page (to the right of Revision History). d. If you would like to deliver an oral presentation but none of the symposia or workshops match your topic, choose “Contributed Oral Presentations”. You can also select “Posters” or “Computer demonstrations”. 5) Next, fill in your abstract’s metadata from the list at the left by hovering over a category, and then clicking on the pencil icon. a. The only mandatory fields are “Title”, “Abstract”, “Keywords”, and “Presenting Author”. b. Titles should have all major words begin with a capital letter (Title Case); please do not use all uppercase or inappropriate italics in your title. c. The submitting author and affiliation are taken from the profile of the logged-in user. d. More authors can be added by clicking the icon beside “Authors” in the left-side navigation panel. Be sure to add affiliations for all authors. Note that it is the contributing author(s) responsibility to notify all authors of this submission. e. The corresponding author and the ordering of authors can be changed from the same menu (use up/down arrows to the right of names). The corresponding author must be available to communicate about the abstract until final acceptance for publication. The presenting author is the person who will be delivering the talk/demonstration at the SPNHC or TDWG meeting. f. The presenting author must register and attend the meeting. 6) Submissions are limited to 600 words (total, no longer just the body of abstract) written in English and must address the conference themes or other topics in biodiversity informatics. Note that this is not a venue for reporting the results of research in your discipline. a. Please write for a general audience with no unexplained jargon (see also 6c). b. The first mention of acronyms or abbreviations in the abstract or figure/table legends must be spelled out (exceptions include GIS, HTML, TDWG, WWW, URL, XML, JPG, TIF, TIFF, PDF). c. Consider embedding links (URLs) to institutions and concepts that will help readers to appreciate more fully the topic you are presenting. This can be especially helpful for jargon. d. If you include references, create the reference list first before linking it to your text (see https://arpha.pensoft.net/tips/Cite-references). e. Please proofread your submission carefully. Once it is accepted, it cannot be (easily) changed. 7) You may add references (included in word count), one figure, and one table by clicking on the appropriate icon. You may also upload supplementary materials associated with the abstract. None of these are required. 8) Click “Validate.” This will ensure that mandatory fields are filled in, you have not exceeded the character limit, and the abstract is assigned to a collection. Be sure to finish this step, even if you and your co-authors are not finished writing or reviewing your submission. 10) The organizers may accept or reject your submission, or may send feedback requesting changes, or suggest submission to a different session. Note that if a submission is returned to you for changes, its status will return to Draft. Only authors will have access to the abstract until you make changes, and redo steps 8 and 9 and resolve all issues. Note that editors can view resolved issues, so if you have feedback, add it there. Your manuscript may require more than one cycle of revision. Please use track changes to make it easier for editors to see where you have made changes to the abstract. Accept or reject suggestions by editors using track changes. Every effort will be made to accept abstracts by 9 April or as soon as possible thereafter. 11) Once the abstract is accepted, the ‘Submit to the journal’ button becomes visible in the ARPHA Writing Tool. 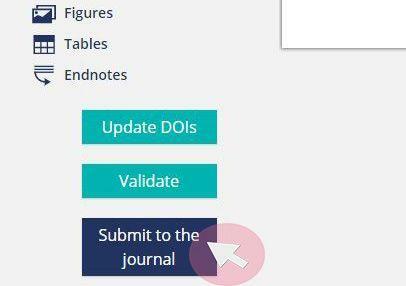 Before clicking on it, click the validate button first to make sure there are no lingering issues https://arpha.pensoft.net/tips/Finalise-a-Manuscript. You will not be able to submit the abstract if any issues are outstanding. Any last changes need to be made now, before you click the submit button. When you are ready to submit your abstract for publication, click the ‘Submit to the journal’ button and go through a checklist of submission steps. One of the items in the checklist regards the license and copyright of your abstract. The current default is CC BY 4.0 with copyright attributed to the authors. Please notify the Helpdesk (see button in top navigation bar) if the terms of your employment do not permit these options. a. The fourth and final step asks you to assign categories to your submission; this step is optional. b. When the submission process is finalised, the abstract goes directly to production and publication, a DOI is assigned, and the abstract cannot be revised further. c. If, after your manuscript has been approved, you fail to complete the steps in #11, you may see it tagged as “Incomplete Submission,” even though an ID has been assigned to it in BISS. Because this is now has a BISS identifier, you must access actions to complete the submission (or delete it) via that dashboard https://biss.pensoft.net/dashboard?view_mode=1&journal_id=63 not ARPHA’s. d. The deadline final submission to the journal is 9 April, to enable us to prepare the program. 12) If at any time you need further assistance, check this Tips and tricks link or if you fail to find an answer to your question, send an email to the journal’s technical staff via the system. Click “Helpdesk” on the top navigation bar to open a new window with an email form for you to fill in. What is a collection? What is a collection editor? Pensoft allows articles to be grouped into “collections” (typically around a theme). The TDWG 2018 proceedings is a collection as is SPNHC 2018, and every workshop and symposium is a sub-collection. You are a collection editor if you are the primary contact (and sometimes those listed as “contributors”) for your workshop/symposium. Please refer to the instructions for editors. Where do I enter the state or province under address as an author? ARPHA does not currently track that information. How do I know the status of my abstract? Sign into ARPHA. Your abstract(s) should be listed under the My Manuscripts tab (text will be gray) on your dashboard. On the right of each manuscript, you can see the status. Note that only one person can work on an abstract at a time. If you are not actively working on a manuscript, please close the window to give others a chance to contribute. Once your abstract has been Approved it will go through various stages (including In Layout) to be Published. The submitting author will then have one final publication checklist to complete. See published abstracts https://biss.pensoft.net/collection/25/ from 2017. Both authors and editors can send email (see icon near the top of the page) to co-authors and/or editors at any time during the pre-approval process, this does not change the status of the manuscript. What if I don’t see my abstract anywhere? It is possible that you have more than one ARPHA account under different emails. Please consolidate them if this is the case. Another possibility is that the ARPHA platform has automatically archived your abstract due to prolonged inactivity (does so after three ignored email warnings). You will need to notify Pensoft to retrieve such an abstract from this fate. Please make sure all communications include an article identifier (ID#) in subject line. When it is returned, it will be in Draft mode and you will need to need to start at #9 in this document. Editors will not be able to work on or accept a manuscript in Draft status. Otherwise, communicate with the help desk to try to resolve technical issues or with conference organizers for content/meeting-related questions.